//SEIBERT/MEDIA has offices at several locations in Wiesbaden, the largest of them residing on the fifth floor of the Luisen Forum, a shopping center in the middle of the city. 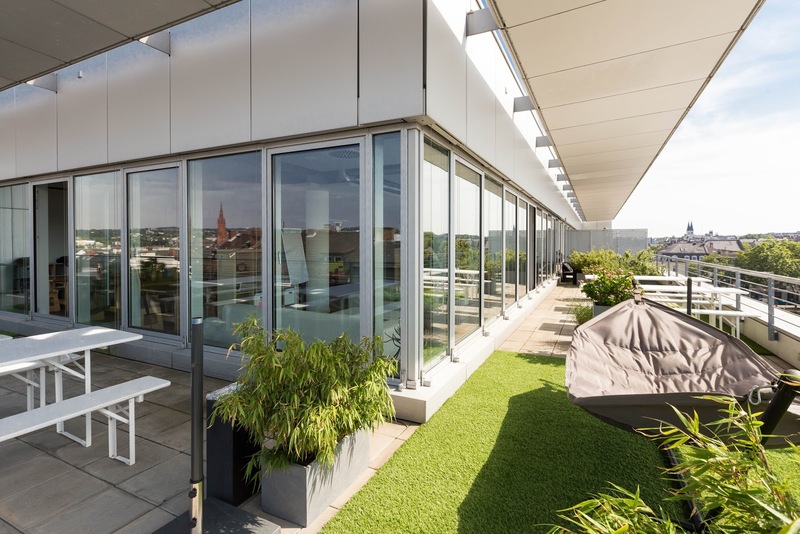 Around the building there is a wonderful roof terrace where you can relax, grill and check out a beautiful view overlooking Wiesbaden. We thought that the location would also be a good place to provide the surrounding pedestrian area with free Wi-Fi. Here at //SEIBERT/MEDIA we believe that people with access to more information will make better decisions and that such access ought to be free. 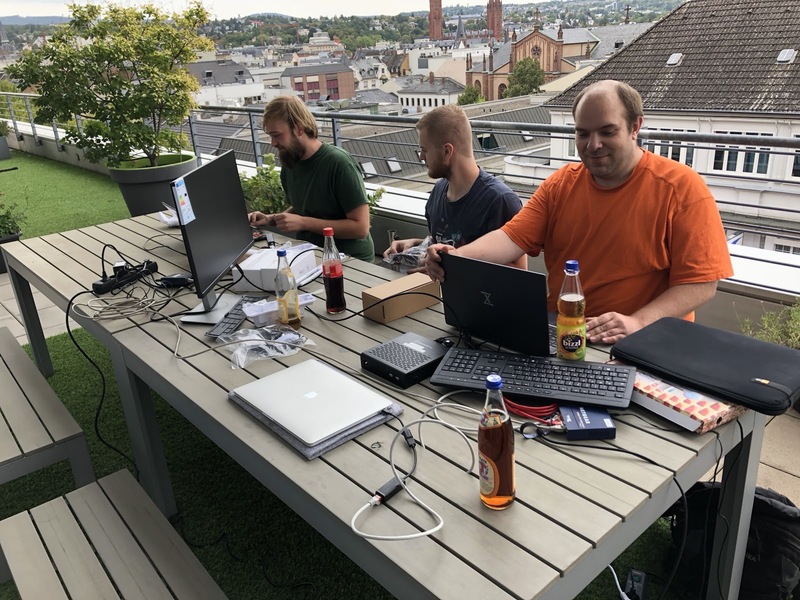 Keeping this in mind, we teamed up with Freifunk ("Free Radio") Wiesbaden and installed a free community Wi-Fi hotspot on our terrace to be used in the surrounding pedestrian area! Here's a quick background: About two years ago we first got together with the folks at Freifunk Wiesbaden. At that time we had our eye on the prize of hooking up the entire Luisen Forum with free Wi-Fi. For a few different reasons we fell a bit short on realizing this goal. 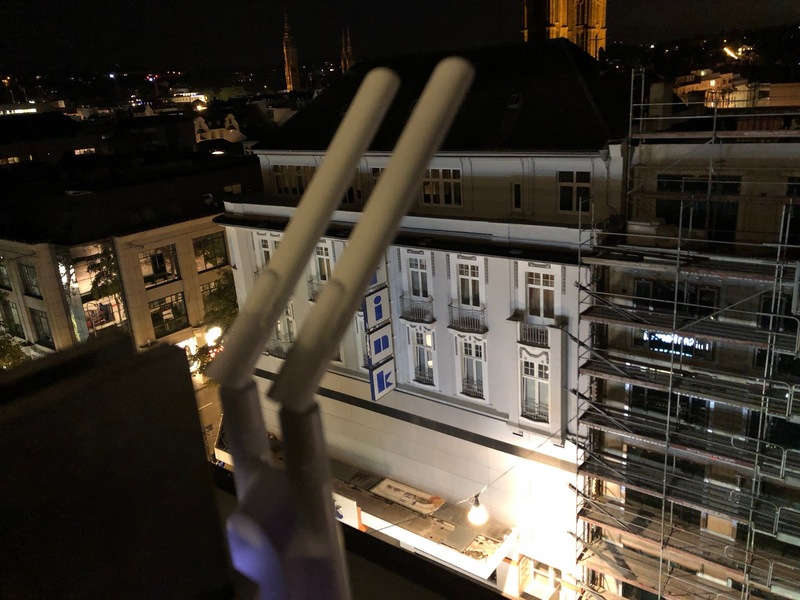 Fast forward to this year: Recently, I discovered by accident (and quite surprisingly) that actually I get the best //SEIBERT/MEDIA Wi-Fi reception down in the pedestrian zone at the center - apparently through the outdoor Wi-Fi access point on the railing of our roof terrace! So we felt that our only choice was to try again. We asked ourselves: couldn't the existing company Wi-Fi be extended to provide free community Wi-Fi? As it turned out, it wasn't quite that simple! However, after running a few small hardware errands combined with a little bit of clever handiwork, it looked like it could be done. We quickly ordered two UniFi UAP-AC-M access points, we already had a router in our "box of random hardware", and voila! We had set up our Freifunk Wi-Fi mesh network! It was a Friday afternoon. The first wireless community hobbyists from the Wiesbaden Freifunk organization came to visit us. Together we began configuring the VPN router and the two mesh access points. The router provides internet access to users of our free-radio infrastructure via our normal internet connection through a VPN to community wireless gateway. 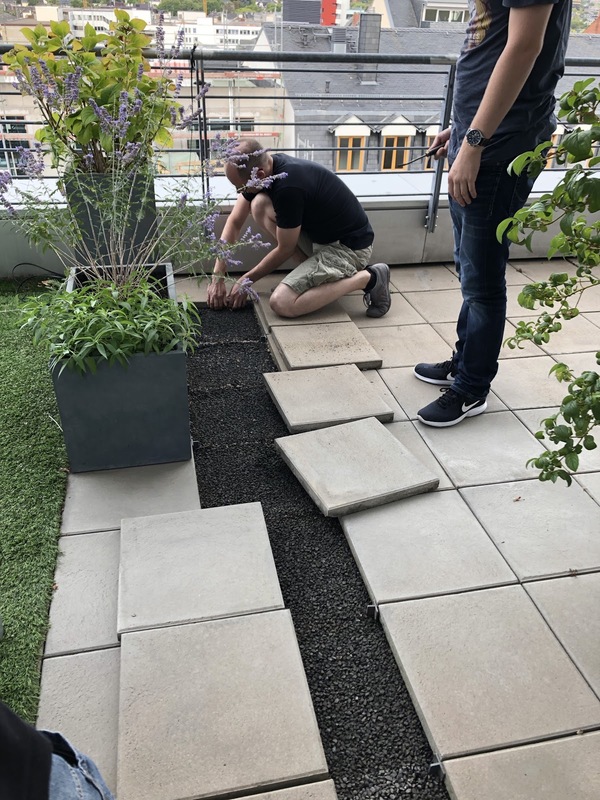 Using its own VLAN, the router connects the free community network to our Wi-Fi infrastructure in the //SEIBERT/MEDIA office - which includes two outdoor access points at the corners of Schwalbacher Street/Luisen Street and Luisen Street/Kirchgasse around the Luisen Forum. Additionally, we've installed Mesh APs inside the shopping mall to boost the signal and also allow people in the surrounding neighborhood to have a stronger free Wi-Fi signal while accessing our community network - likely some have since chosen to opt out of buying their own home router. We also discussed installing directional antennas in order to extend the free community network further than the current external infrastructure. The location on the fifth floor - high above Wiesbaden - is an excellent choice. We threw a barbecue to celebrate the launch of the new free community network project. There was something for everyone! 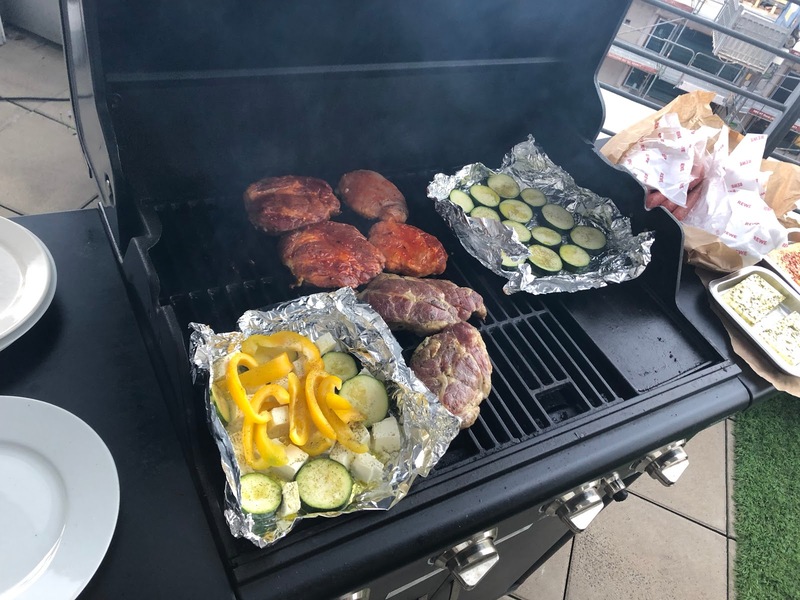 We had a range of barbecued goodies with salad and bread, and enjoyed the late summer weather together. We finalized the last bits of the configuration and were able to put the entire system into operation. By the end of the day - shortly after midnight - we had finished setting it up and all access points were ready for use. By Saturday we could already count more than 50 users on the community Wi-Fi network! 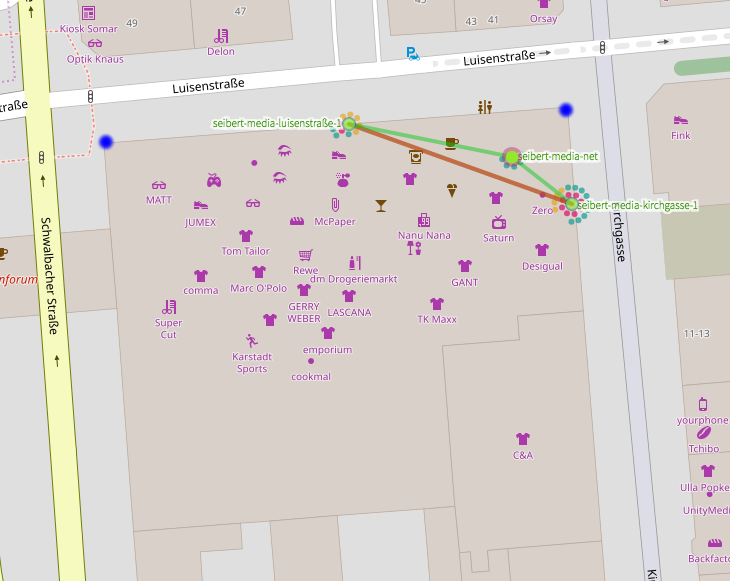 Freifunk Wiesbaden provides live, up-to-date statistics and status information about the network on their map. After the success of this experiment, our new goal is to offer free Wi-Fi from the other //SEIBERT/MEDIA offices along Kirchgasse and Adolf Street. We're also discussing the possibility of establishing directional radio links to connect with other free community network locations which may not have their own uplink. In short: We still have a lot to do. Plus we'd like to continue working together with our neighboring Freifunk project teams!